A very versatile LCD enclosure with LCD display window. Recessed area for membrane keypad. Battery options include: 2AA, 3AA, 4AA, 6AA, 1 or 2-9V, 2C, 4C and No battery. 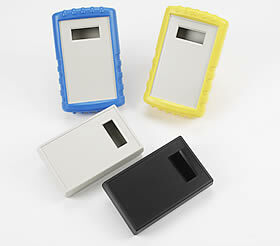 All LCD enclosures supplied with recessed top for membrane keypad or overlay. 100 Series LCD Case-Flat Bottom, 4 AA batt. 7.5 x 4.0 x 1.29"
100 Series LCD Case-Flat Bottom, No batt. 7.5 x 4.0 x 1.9"
100 Series LCD Case-Flat Bottom, 9-volt batt. 100 Series LCD Case-Flat Bottom, 6 AA batt. 100 Series LCD Case-Flat Bottom, 4 C batt. 100 Series LCD Case-Flat Bottom, 2 C batt. 100 Series LCD Case-Flat Bottom, 2 AA batt. 7.5 x 4.0 x 1.2"
7.5 x 4.0 x 1.75"
Height Expander - adds 0.40"
Pouch, belt strap, adjustable from 8.75 x 4.75 x 1.75" to 7.75 x 3.75 x 1.75". Velcro cover with see through window.